Srikshetra, popularly known as Puri, is one of the famous Sakta pithas of Orissa. The temple of Goddess Bhubanesvari is an important Sakta shrine of Srikshetra. It is situated to the north of the western gateway within the inner enclosure of the Jagannatha temple. This temple is exactly located next to the Khirachora Gopinatha temple. Goddess Bhubanesvari is greatly revered by the local people and she is also considered by some devotees as devi Kamala. Five Sakta deities are being worshipped inside the temple, hence this shrine is termed as Panchasakti temple. The other Saktis are Sarasvati, Gayatri, Savitri and Sasthi. Goddess Bhubanesvari occupies a unique place in the temple, while the other four deities are installed at different places of the natamandapa of that temple. Goddess Bhubanesvari is one of the Dasamahavidyas and she is being worshipped by devotees as Istadevi. One of the native rulers of Puri built the present temple for Goddess Bhubanesvari. Sometimes this temple is locally called the Sarasvati temple. 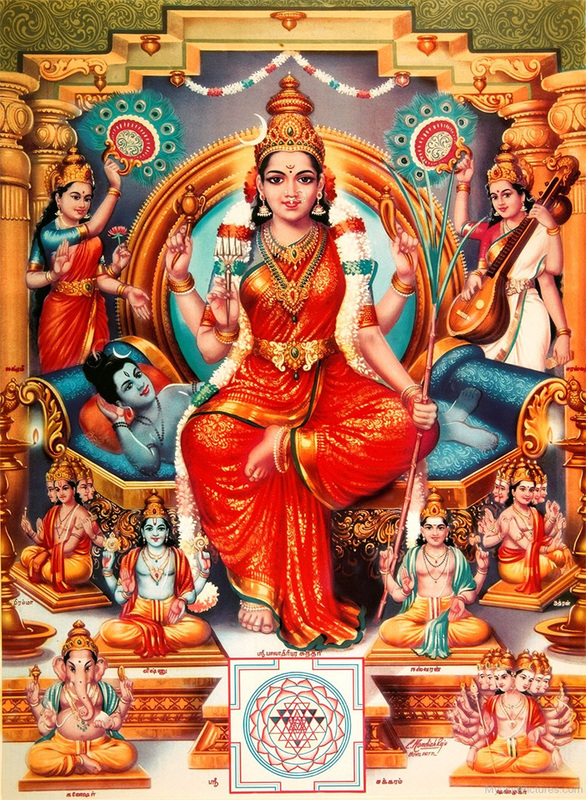 Students and others desirous of acquiring knowledge worship devi Sarasvati, who is known as the Goddess of Learning. So, those devotees who visit Lord Jagannatha of Srimandira also visit Goddess Bhubanesvari. The temple of Bhubanesvari consists of four structures such as vimana, jagamohana, natamandapa and bhogamandapa. This temple is made of sandstones, which are locally called as Baulamala and Kandapathara . The temple of Bhubanesvari faces to east. All the structures of the temple had been deplastered by the Archaeological Survey of India, Bhubaneswar Circle in 1990’s. The vimana of the temple is a sapta ratha rekha deula and its height is about 38 feet from the surface of the temple complex. It stands on a low platform of 2 feet high. The plan of the bada is a square of 15 feet. The bada of the vimana is trianga type, i.e. having three divisions viz, pabhaga, jangha and baranda . 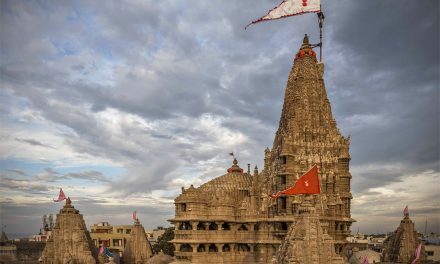 The pabhaga consists of five conventional mouldings of khura , kumbha, patta, kani and basanta. The jangha of the bada consists of single story and its pagas are decorated with khakhara mundis. Three side central niches of the bada are housed with images of the Devis who are acting as the parsvadevatas of the presiding Deity of temple. The two-armed devi image is the parsvadevata of southern side. It has been installed on the double-petalled lotus pedestal. Here, Devi is in padmasana posture on a carpet. The two hands of the Devi are completely broken. The pedestal of the Deity is decorated with female devotees and lush foliage. Two female attendant figures are flanked on either side of the Deity. The backside head of the Deity is relieved with trefoil makara headed arch, which is surmounted by the kirtimukha motif. Two flying apsara figures are carved on the both side top corners of the slab. The four-armed Devi image has been installed as the parsvadevata of the western side. Here the four hands of Devi are also completely damaged. The Deity has been installed on the double-petalled lotus pedestal. Another four-armed Devi image is the parsvadevata of the northern side. Here the Devi image has been installed on the double-petalled lotus pedestal. She has four hands, which are also completely eroded. The decorative designs of the slab are like the southern side parsvadevata image. The attributes in hands and proper identification of these side Deities is not possible to remark on at present. Because all these three parsvadevatas are built in soft sandstones, the images are completely eroded by nature. The baranda of the bada consists of a single vertical moulding. The bada of the vimana is surmounted by the curvilinear superstructure and it displays seven pagas or rathas. All the pagas of gandi are devoid of decorative ornamentations except the jhapa simhas and dopichha lions. The jhapa simhas are projected on the three sides viz, northern, western and southern central raha pagas of the gandi. There is a gajakranta motif (lion on croachant elephant) is projected on the middle portion of the front (eastern) side raha paga. Dopichha lions have been projected on the top of the kanika pagas of gandi. Deula carini figures are inserted in the four cardinal directions of the beki above rahas. They are acting as the supporting elements to the amalaka sila of the mastaka. The mastaka of the vimana consists of usual elements of Orissan rekha deula viz beki, amalaka sila, khapuri, kalasa and ayudha (cakra). The sanctum of the vimana preserves the image of Bhubanesvari as the presiding Deity of the temple. This Deity has been installed on the simhasana of one foot high. She is carved seated on a white lotus in padmasana pose. She has four arms; the right upper hand holds ankusa, the right lower hand displays varada mudra, the left upper hand shows naga phasa and the left lower hand displays abhaya mudra respectively. She is also three-eyed and has the crescent moon on her crest. The image of Bhubanesvari is made of chlorite and its height is about five feet. This Deity is also adorned with different ornaments on her body. The backside head of the Deity is decorated with trefoil makara headed arch. On the basis of a local legend, it is said that the image of Goddess Bhubanesvari was built by a stone which was initially used by a poor Brahmin, who used to sit on it for prayer and meditation to Goddess Bhubanesvari. Inner walls of the sanctum are devoid of decorative ornamentations. The sanctum has one doorway towards the jagamohana. The doorjambs of the main sanctum are finely decorated with scrollworks, flower designs and creepers with frolicking boys. The doorway lintel of the sanctum is devoid of decorative ornamentation. There is no navagraha slab above the doorway lintel. Diminutive Vairaba images made of stone are installed on either side of the doorway and they are acting as the dvarapalas of the main shrine of Goddess Bhubanesvari. 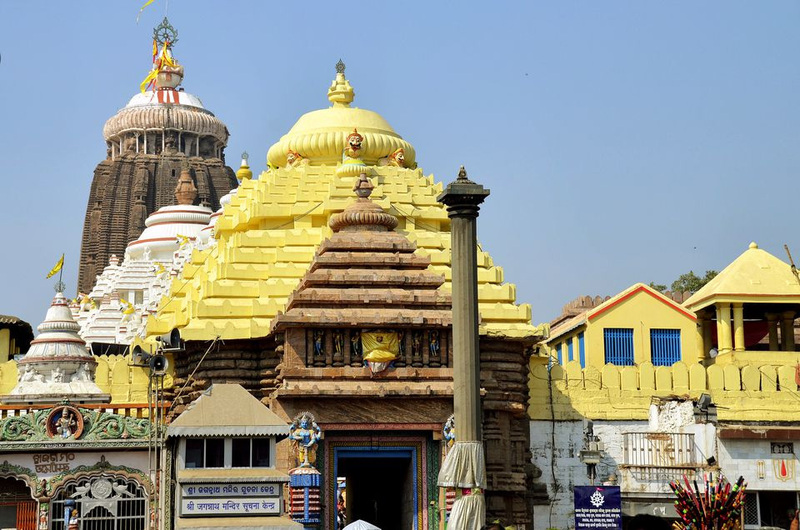 The jagamohana of the temple is a pidha deula and its height is about 25 feet from the surface of the temple complex. It stands on a platform of 2 feet high. The piñöa or platform is consisted of three horizontal mouldings. The plan of the bada is square of 15 feet. The bada of the jagamohana is panchanga type, i.e., having five-fold divisions such as pabhaga, tala jangha, bandhana, upper jangha and baranda. All the component parts of the bada are undecorated except the upper jangha. The pagas of upper jangha are relieved with pidha mundis. The bada of the jagamohana is surmounted by the pyramidal superstructure. 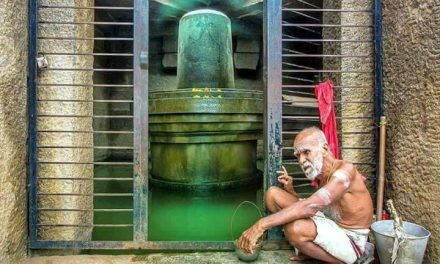 It consists of two potalas viz, the lower and upper potalas, which contain five and four pidhas respectively. Each potala contains a mastaka design on the middle portion of the upper pidha On all sides. Dopichha lions and Deula carinis are not found in their respective places. The mastaka of the jagamohana consists of beki, ghanta (bell shaped member) above which there is another beki, amalaka sila, khapuri and kalasa. Here the ayudha is completely missing. The inner walls of the jagamohana are devoid of decorative elements. The jagamohana has one doorway towards the natamandapa. The door jambs of the eastern side (doorway) are completely undecorated. Gaja-Lakshmi image as well as navagrahas are completely absent in their respective places of the doorway. Natamandapa The natamandapa of the temple is a pidha deula and its height is about 20 feet from the surface of the temple complex. It stands on a platform of 2 feet high. The base of the bada is rectangular. The bada of natamandapa is panchanga type, i.e., having five-fold divisions, such as pabhaga, tala jangha, bandhana, upper jangha and baranda. All the component parts of the bada are devoid of decorative ornamentation. The bada of the natamandapa is surmounted by the pyramidal superstructure. There is only one kalasa found from the top of the upper pidha of gandi. The inner walls of the natamandapa contain some Deities in its niches. The image of Sarasvati is housed towards the western side wall, while the images of Savitri, Gayatri and Sasthi are installed in the niches of the right side western wall of the natamandapa. Goddess Sarasvati has been installed on her conventional mount goose (hamsa). The height of Devi Sarasvati is about one foot. She holds veena in her two hands and faces to the east. Devi Savitri is two-armed and she is considered by devotees as the Sakti of Brahma. The image of devi Gayatri is carved in padmasana pose. The image of Sasthi devi is three-armed and she holds a child on her left lap. The posture of devi Sasthi is very attractive to devotees. There is also an image of Narasimha installed in the left side of the western wall. He displays as usual attributes in hands. Another notable image of Narayana has been installed on the niches of the western side inner wall. He holds chakra in right upper hand, conch in left upper hand, gada in left lower hand and the right lower hand is in varada mudra, respectively. The image of Narayana is in standing posture on the decorated pedestal. Jaya and Vijaya figures are flanked on either side slab of Deity. Besides the above images, two other small images are also noticed near the image of Sasthi devi. Some people consider them as the family members of Sasti devi. The northern side left wall of the natamandapa is finely depicted with the painting of Jagannatha. The natamandapa has three doorways; one on each side, i.e., northern, western and eastern sides respectively. All the doorways are devoid of decorative ornamentation. The bhogamandapa of the temple is a pidha deula and its height is about 18 feet from the surface of the temple complex. The pyramidal superstructure of the bhogamandapa is supported by ten circular pillars. There is only kalasa found from the top of the upper pidha. Both the structures of natamandapa and bhogamandapa are the latter addition. There is no authentic historical evidence with regard to the approximate date of the Bhubanesvari temple. On the basis of the architectural features, the construction period of Bhubanesvari temple can be tentatively assigned to the 16th century AD. On the 5th day of the bright fourth night of the month of Magha, Saraswati puja is observed in this temple with great devotion. This day is known as Basanta Panchami or Sri Panchami. The Parbana Puja or Sola Puja of Goddess Bhubanesvari is also observed by Saktas in the month of Asvina. At present, this temple is under the protection of the Puri Circle of the Archaeological Survey of India. It is known from the above discussion that the temple of Goddess Bhubanesvari is one of the important Sakta shrines of Srikshetra. Though the architectural features of the temple are not as important as other notable temples of Orissa, the shrine preserves a good number of sculptures of different Deities for worship. From the religious point of view, the temple of Bhubanesvari is very important, because five Sakta deities (Panchasaktis) are being worshipped in this shrine. Obviously, the temple of Goddess Bhubanesvari possesses a unique position in the cultural history of Orissa. Really amazing temples, thank you so much for sharing.